How do NYC Females go Italian? “What are you doing?” That’s what Lola asked me when she walked into my apartment yesterday. I don’t blame her for the look of curiosity (gawking), I imagine what I was doing looked like I was systematically trying to puncture my arms with tiny holes. That wasn’t what I was actually doing, though. I work hard to keep my skin soft! What had happened was that I had the most unfair tiny amount of the Estée Lauder Tuscany Per Donna Eau de Parfum Spray left ($45.00 at Macy’s – oddly, $46.00 at Nordstrom). Since I am sort of a non-certified genius, I had been taking the bottle apart to get every last bit of ‘scent’. This somehow ended up involving…well, I don’t even know what I was doing. What can you learn from this? There has to be a lesson. Well, if there’s a perfume I’m willing to physically hurt myself over (it left some little indents at first!) then you know it smells ridiculously good. I want to let you know that it’s what I consider a more ‘mature’ scent. To clarify, I mean that in terms of age, and maturity level. If Paris Hilton wore this perfume – it would be WRONG. But Natalie Portman (who I am assuming is same in age) could bathe in it. So, if you’re anywhere between 20-100, this might be a perfume you’ll love. 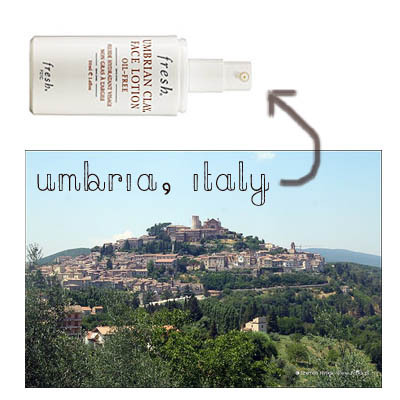 Fresh Umbrian Clay Face Lotion ($65.00) at Sephora is made from clay from you guessed it – Umbria, Italy! The photo of Umbria is from szymon nitka on Flickr.